GDP grew an annualised 1.4 pct last quarter, marking the longest unbroken growth run in 16 years. The data is volatile, and often revised, but a global boom appears to be offsetting weaker domestic demand. That underscores the need for further structural reform. Japan's national flag is seen in front of containers and cranes at an industrial port in Tokyo, Japan, January 25, 2017. Japan’s economy grew by an annualised 1.4 percent in the three months to September, government figures showed on Nov. 15. Analysts polled by Reuters had forecast a 1.3 percent expansion. The statistics, which are preliminary and seasonally adjusted, contrast with a revised 2.6 percent growth rate in the previous quarter. 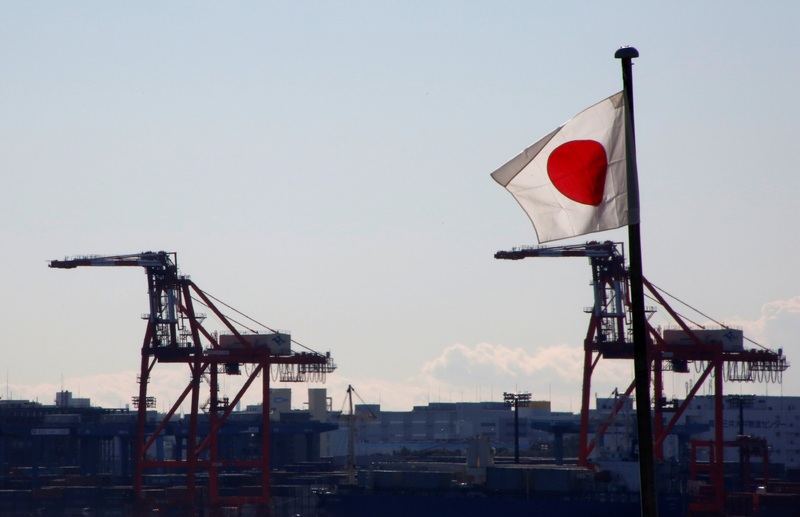 Japan’s economy has now grown for seven consecutive quarters, according to Reuters. Compared to the previous quarter, GDP rose 0.3 percent. The largest contributor was net exports, which boosted quarter-over-quarter growth by 0.5 percentage points, while the largest drag was from household consumption, which deducted 0.3 percentage points. A Cabinet Office official told reporters the decline in consumption was driven by lower spending at restaurants and hotels, as well as reduced spending on cars and mobile phones, Reuters reported. Bad weather during the quarter may have hurt spending, the official said.